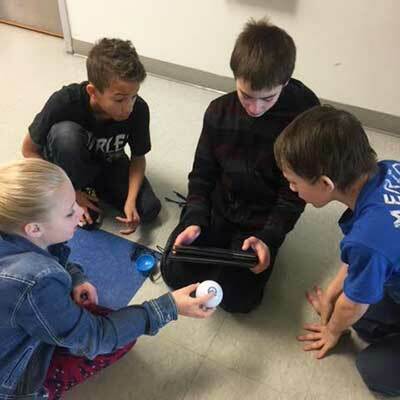 Foundation donors have funded over $200,000 in technology-related grants, programs, and equipment for students and teachers. Computers are no longer an option in our society which makes them a crucial component of each student’s education and an essential tool for our teachers. Computers and technology do not replace paper and pen or textbooks. They complement these tools. Textbooks can be brought to life when students are able to visit a civil war “site” using virtual reality. Students can collaborate with others easily and the research possibilities are limitless. When a spelling or math test is taken by students using their Chromebook, teachers are provided with almost instantaneous student achievement results, allowing the teachers to address student needs while the topic is still top-of-mind with students. 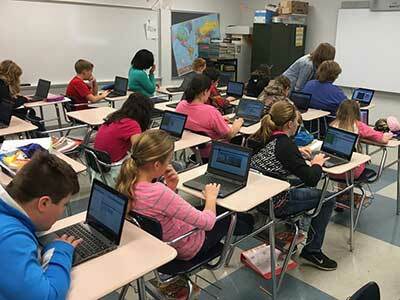 Beginning in 2018-19, The District will initiate Phase I of it’s 1:1 computer initiative when every student in grades 3, 4 and 5 will have their own Chromebook. Phase II of the 1:1 initiative will be activated in the 2019-2020 school year when all students in grades 6-12 will have their own Chromebook. In addition to the 1:1 initiative, The PBL Education Foundation is providing The District with $45,000, 2018-2020, to allow the purchase of 2 mobile laptop carts. The Jr. High School will use one of the laptop carts to participate in Project Lead The Way. The second cart will be used at the high school for STEM (Science-Technology-Engineering-Math) projects requiring robust processors and memory. “I attended Project Lead the Way Design and Modeling course training in June of 2017. The course introduces the design process to students and encourages creativity and innovation. It’s a very collaborative and hands-on program that leads to a deep comprehension of the design process. The culminating activity is to design a therapeutic toy for a child who has cerebral palsy, using sophisticated technology that engineers use in their everyday work. The thing is, you can’t do PLTW without up-to-date technology! Trying to piece together the program, while leaving out the more technologically advanced aspects, just wouldn’t have the same impact! That’s why I’m so glad that PBL school district, the PBL Education Foundation, and the entire PBL community realizes the importance of staying current with technology.